USA - Tomcat understands the importance of not only having the best truss and hoist/rigging equipment for your support structures, but also having the experience and knowledge to use it correctly and safely. With this in mind, Tomcat is reintroducing its popular Tomcat U for newcomer and veteran riggers and hoist technicians in the entertainment industry. Building on the 18-year history that made Tomcat U famous, Tomcat is reaffirming its commitment to the continuing education of riggers and hoist technicians around the country. 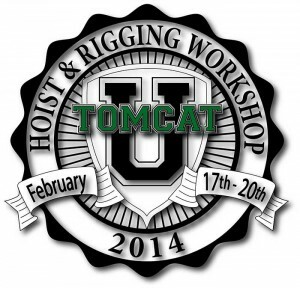 The 2014 Tomcat U takes place from February 17 -20 in Knoxville, Tennessee, home to the Tomcat factory and epicenter for the education of riggers and hoist technicians. "The schools give extra value. I’ve been to three Tomcat schools and have used this training in practical applications. The knowledge and hands on experience from Tomcat U have given me the confidence to handle situations when they turn nasty," says Kurt Jaeckel of Quickbeam Systems. 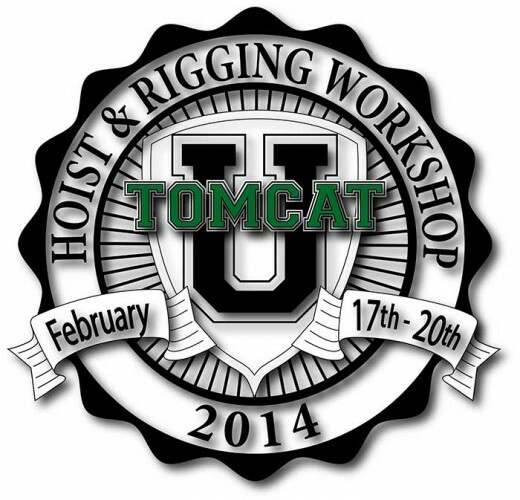 Tomcat U is an annual all-inclusive four-day hoist and rigging school given by experienced industry professionals in Knoxville, Tennessee. Considered the most comprehensive training course of its kind, Tomcat U is a unique combination of hands-on workshops and information-filled lectures on a wide variety of specialized areas. Some of the subjects covered include instruction on truss designs and their use, safe rigging practices and principles, using chain hoists and troubleshooting, and fall protection. By the end of the four days, you will have a better understanding of truss, how to work with it more effectively, how to increase your personal safety and how to increase the safety of your structures. "Tomcat U is a really positive experience for riggers and users of truss. It’s a fun thing all around. Everyone who attends it has a blast," reports Dana Bartholomew of FTSI. In addition to the knowledge and training you receive, Tomcat U is also a social gathering of like-minded professionals and newcomers in this "entertaining" slice of the entertainment industry. Whether you have 30 years in the business or you’re just starting out, it’s an amazing networking opportunity that can help you gain important contacts, while making new friends and exchanging information. Participants include many interesting and dynamic riggers and hoist technicians, who always have a wide range of entertaining recollections and even some horror stories from the wonderful world of truss. Tomcat U is an event that builds bonds and creates alliances in this specialized field. Working with support structures in the entertainment industry is a challenging and rewarding job that is carried out by a select group of professionals. Having the knowledge and experience to do it competently and safely is of paramount importance. Tomcat U gives you the ammunition you need to tackle your chosen profession in the most professional manner, while providing an enjoyable and entertaining atmosphere that will be remembered for many years to come.